The Marple Leaf: The Englishman who transformed Benfica. The strange tale of Ted Smith. The Englishman who transformed Benfica. The strange tale of Ted Smith. Who was the English manager who triggered a revolution in European football, and transformed a club side that became one of the giants of the modern game? Terry Venables? Nope. Sir Bobby Robson? Nah! Roy Hodgson? Come on! No, the name Ted Smith will hardly register, but his extraordinary story is as dramatic for the gaps and mysteries as it is for the affect a journeyman Millwall footballer from Grays in Essex, had on the Benfica team he coached from 1948 to 1952 and challenged Real Madrid’s hegemony in the subsequent decade. Indeed, while this football revolution was underway, the man who planted the seeds had quietly retired from football and was running a pub in Lancaster, having only occasionally dipped back into football with Workington in the Third Division North from 1953-54, before the great Bill Shankly took over, and later with the local non-league side Lancaster City in 1967. I stumbled across this story by accident. My grandfather, John Stanley Taylor, had been a Commando in the war, served his country heroically and was a man of some stature in the community in Lancaster where he had moved to be the manager of Woolworths. He became friends with Ted Smith, pictured above, who at the time was the landlord of the Red Cross pub in Skerton, just over the River Lune from the city centre. But John Edward Smith, to give him his full name, had a back story. 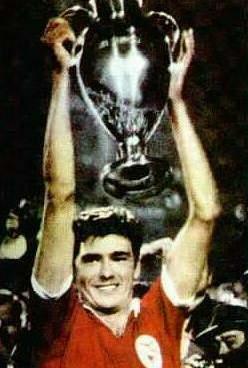 While he was pulling pints and smoking full strengths Capstans in a fairly draery concrete riverside pub, the Benfica team he built were lifting the European Cup; first in 1961 and then again in 1962. The captain of the team was the legendary Jose Aguas, the lynchpin of a side that went on to break Real Madrid's dominance of European football in the 1960s, then doubling the triumph by defeating Barcelona a year later. Smith had brought Aguas, from a poor white colonial family in Angola, to Portugal and the two had a strong bond. I know this because my own Dad witnessed their emotional reunion outside the Park Lane Hotel in London in 1962 when Benfica were in town for the European Cup semi final at White Hart Lane against the double winning Spurs side. As a player Smith had been decent full back with Millwall, playing 143 times and scoring just once. Small pieces of Pathe news archives show him training in 1938 and introducing the Millwall team to King George VIth, a sight which his son Harvey has delighted in watching since, as he was too young to see him play in person. After England stuffed Portugal 10-0 in May 1947, with Finney and Matthews starring, it was decided to search for an English coach. How Smith came be in the right place at the right time is a mystery, or just a piece of good timing. But almost as soon as Smith moved to Lisbon in 1948 he quickly made changes. As well as attracting players from the Portuguese colonies, like Aguas, he also introduced a form of health service between the local people in a poor area of Lisbon, and the club. On the pitch he worked wonders too. 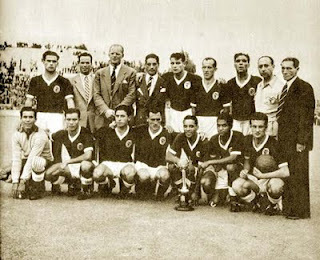 Benfica broke the dominance of Sporting, by winning the 1949 Cup. He then built on that and won the 1951 championship, added 2 more cups and Benfica’s first international title, the Taca Latina, the ancestor of the European Cup, featuring clubs from France, Spain, Italy and Portugal. The record books show he retired for ‘personal reasons’ and though skipping his job as coach, he kept a link to Benfica as youth coach. Another side to his character was a jealousy as his attractive wife proved the centre of attention from the Portuguese players and hangers on at the club. Smith sent his family back to England, tried to go it alone for a while, but eventually followed them home. His life appeared torn, though he fell in love with Portugal its people and its culture, especially the music of Fado, it became a burden to him. He briefly returned to football in the unlikeliest of jobs - a newspaper cutting from the Lancaster Guardian rather nonchalantly reports how "Mr Ted Smith, the former Benfica coach," became the manager of Lancaster City FC in 1967, as if that achievement was on a par with joining from Barrow or Bamber Bridge. He returned briefly to management at Portuguese side Atletico from 1971 to 1973, but it seems remarkable that so little is known of his life and his achievements. Even Harvey has told me only the sketchy details he has learned; his father passed away in 1993 and is buried in the English cemetery in Lisbon, where Benfica looked after him in his final years, respect and love from a fine club who remembered a hero of their history. But there are huge gaps in his life. These gaps add to the mystery and the sadness that lies behind a torn character unable to settle in one place or anoher. Even his own son, Harvey, has bitter sweet memories. Running a pub in the north of England, and later in the Lake District, could never capture that romance in his life again. Harvey has told me: “There is so much that I don’t remember and most of the medals and trophies my dad acquired over his time in football have gone, lost or been stolen, however, everything I read from his time in Portugal assures me that he was most highly regarded. There are quotes of him as being part of the club’s history, the layer of the club’s foundations and a beloved son of a great club.